As Director of Product Management, Dan Klaeren maintains responsibility for Syniverse’s Wi-Fi services. 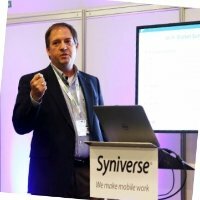 In this role, he collaborates with Wi-Fi operators, mobile operators, and enterprises to identify and develop new solutions, including Mobile Marketplace, Syniverse’s centralized, user-friendly platform that enables service providers and enterprises to easily buy and sell Wi-Fi with the click of a button. Dan has over 20 years of experience in developing and managing information technology solutions, which have included roles at PricewaterhouseCoopers, Fidelity Information Services, Prudential and the U.S. Navy. Prior to joining Syniverse, in 2012, Dan led several small businesses that specialized in delivering custom mobile applications, mobile content delivery systems and mobile messaging applications. He holds a Bachelor of Science in information technology from the University of Phoenix as well as an Advanced Mobile Development certification, and he is a frequent contributor to the development of Wi-Fi standards for industry groups.